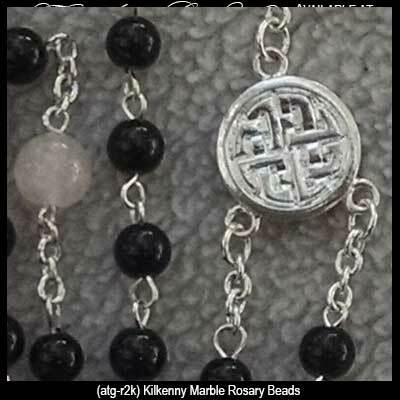 This Irish rosary features Kilkenny marble beads along with rose quartz accent beads and it is further enhanced with a silver plated Celtic cross and knot-work center piece. 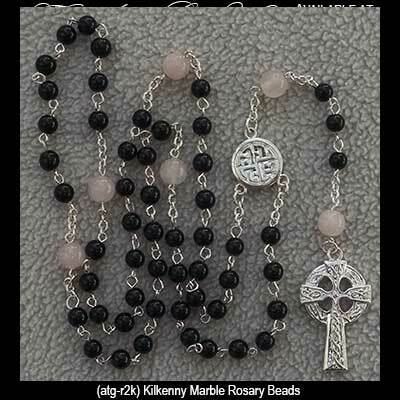 The Kilkenny marble rosary is a full five decades and it is made in Kilkenny, Ireland by All That Glisters. These Irish rosary beads are gift boxed with Celtic knot, Celtic cross and Kilkenny marble history cards, complements of The Irish Gift House.